When a person is hospitalized, it is important to encourage contacts with family and friends. While there are some situations where visitors are not allowed, the hospital maintains an open visiting policy. We discourage visits after 9 p.m. or before 7 a.m. We want our patients to be well rested, to maximize the healing powers of sleep. But if conditions require that you visit during those hours, please make arrangements with the nursing staff and we will do everything we can to accommodate you. Visitation in Intensive Care is limited to 5-10 minutes every hour, for the same reasons. While there are exceptions, such as patients who need the continuous comfort of a loved one, only the nursing staff can make those exceptions. Some patients may be placed in isolation. In this case, you will need the permission of the nursing staff to visit the patient, and you will be required to wear personall protective equipment, whether that is a mask, or a full isolation suit. 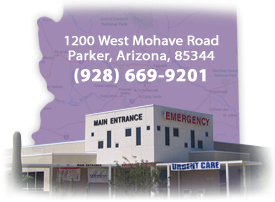 If you want to check on a patient via telephone, call (928) 669-9201. Privacy rules require that you give the name of the patient before we can confirm that they are in the hospital. We can only tell you if they are in, not their condition other than "good", "fair", "stable", "serious", "critical", or "guarded." We want our patients to have the support and love of family and friends, and will work with you to accommodate your visits.